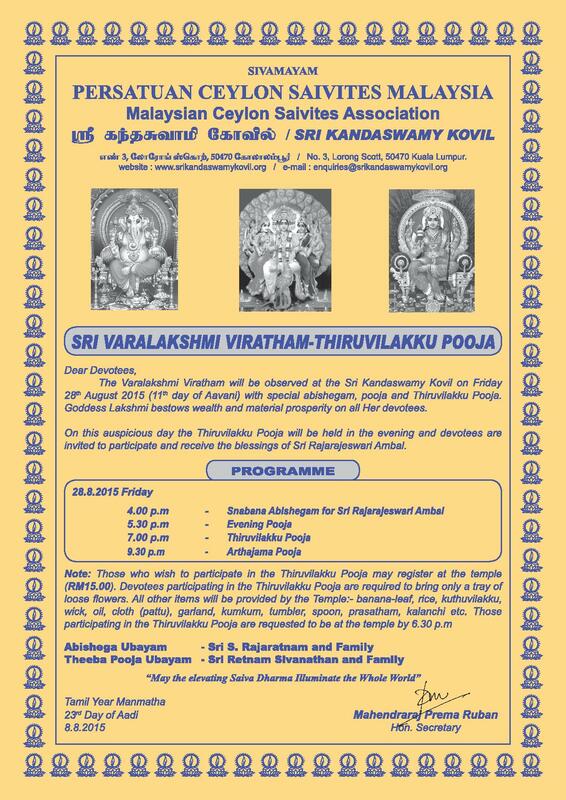 The Varalakshmi Viratham will be observed at the Sri Kandaswamy Temple, Brickfields on Friday 28th August 2015 ( 11th Day of Aavani ) with special abishegam, pooja and Thiruvilakku Pooja. Goddess Lakshmi bestows wealth and material prosperity on all Her devotees. Note: Those who wish to participate in the Thiruvilakku Pooja may register at the temple (RM15.00) before 28th August 2015. Devotees participating in the Thiruvilakku Pooja are required to bring a tray of loose flowers. All other items will be provided by the Temple: – banana-leaf, rice, kuthuvilakku, wick, oil, cloth (pattu), garland, kumkum, tumbler, spoon, prasatham, kalanchi, etc. Participating devotees are also required to bring the registration receipt on the day of Thiruvilakku Pooja.